St. Margaret Parish offers ministries related to Worship & Spirituality, Evangelization, Education, Service & Outreach, and Community Life. 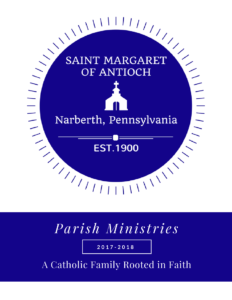 Click the image above to view and download our new Parish Ministry Brochure and discover all ministries and contact information to discover what ministry may work best for you. Located on the stage in the Antioch Annex. Books, videos, DVDs and tapes are available each weekday morning, plus Sunday morning before and after Masses. Though rectory staff prepare the bulletin and publish key information on the website, volunteers help maintain the website and add content of interest to the Parish Community. We would love to take advantage of social media, including Facebook and Twitter, but have not started that effort yet. We need your help! Send an email to Lyle Nehls (lyle.nehls@gmail.com) or to the rectory (office@saintmarg.org) that you would like to help. The Sunday Bulletin provides up to date information on the various activities of the parish, including a monthly calendar. The rectory sends a weekly email to interested members of the Saint Margaret Parish family every Thursday containing a link to the coming weekend bulletin and a short list of key upcoming events– email the rectory (office@saintmarg.org) if you would like to be added to the Thursday email distribution list. You are encouraged to become involved in the life of your parish!